I’m in the final stretch of the marathon, the last straightaway of the 400 meter dash, the last push toward the wall in the 1500 meter freestyle. I’ve still got 3/4 of a sleeve left. And blocking. 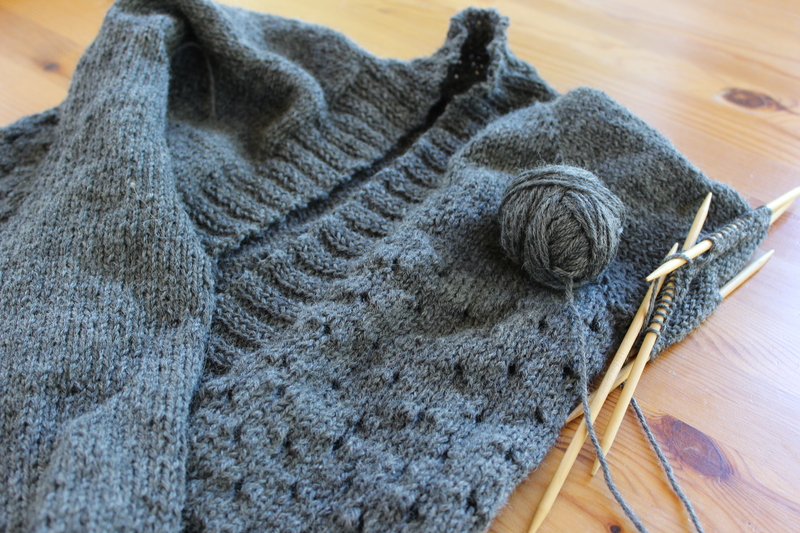 This sweater feels like it’s taking forever, which is crazy, since I’ve only been working on it for two weeks. It’s funny, I zoomed through the body of the sweater, which was the biggest part of the project- all that stockinette and all those eyelets. It was fun, easy, uncomplicated. But now that I’m doing the sleeves, it feels a bit like pulling teeth. I don’t know why, it’s just plain old knitting in the round with a handful of decrease rows. Nothing difficult. It took me two whole days to finish the right sleeve! Two days! Hopefully it won’t take me two more to finish the left. And now, here I am procrastinating on my sleeve by writing this post (which was only supposed to be about three sentences long). Enough faffing around. I’d better buckle down and finish up. The closing ceremony is on Sunday, after all! How are your Olympics going? And have you watched any synchronized swimming?! It’s amazing! This entry was posted in Knitalong and tagged campside cardi, cardigan, knitalong, knitting, olympic knitting, olympics, ravellenic games, ravellenics, sweater on August 19, 2016 by onemilljellybeans. Sounds like you need a good series on Netflix to watch and keep you captive while you knit! I’ve heard Wentworth is good.